BERLIN – The third film in Turkish filmmaker Semih Kaplanoglu’s trilogy about a young poet named Yusuf, “Honey” (Bal), sees him as a 6-year-old learning the harsh realities of nature as his beekeeper father disappears in the forest. This splendid won the Golden Bear in competition at the 2010 Berlin International Film Festival with a running time of 103 minutes. For commercial release, it has been trimmed to 87 minutes, which is a shame in many ways but probably will not harm the picture’s power and graceful charm. Measured and contemplative with a remarkable screen performance by Boras Altas, then 7, and superlative cinematography by Baris Ozbicer, the film will follow its predecessors in winning great appreciation at film festivals. It might also attract art houses with audiences interested in things bucolic and spiritual. 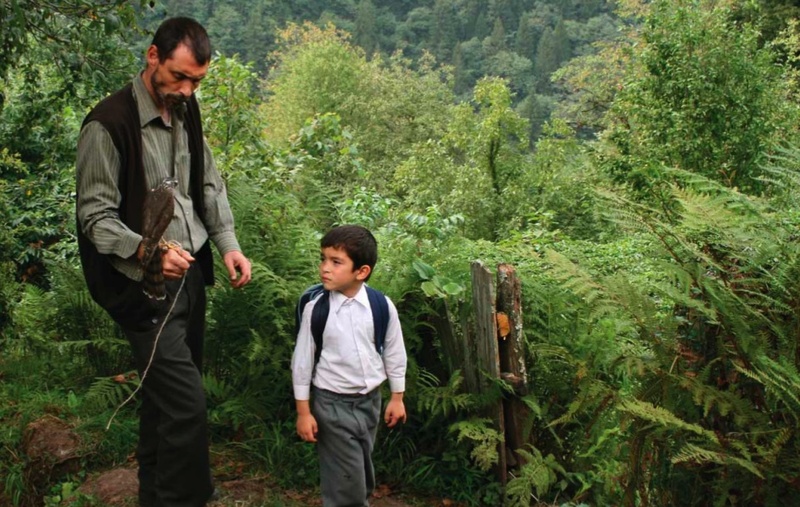 The relationship between the beekeeper (Erdal Besikcioglu) and the forest is established early in the film as we see how closely the boy follows in his father’s footsteps. The cages for the honey are placed high in tall trees so his work is very dangerous and almost right away while he is off working alone, a tree snaps and the man is left hanging by a rope. The film moves back to tell how he came to be there. Kaplanoglu and his co-screenwriter Orcun Koksal contrive small and delicate scenes to evoke the strong emotional bond between father and son. They whisper to each other and the boy learns about time and place, the nature of birds, and the names, smells and taste of flowers. Mother (Tulin Ozen) is a benign but mostly silent presence and only comes to the fore when her husband is believed missing. In a touching scene, the boy who has shown that he hates milk, drinks a glass down unasked just to please her. The boy’s struggle to read and please his teacher in class contrasts with his assurance in the woods and while the fate of his father remains unknown, the film conveys powerfully that the boy will continue to know his way. Kaplanoglu draws a multi-faceted performance from the boy helped greatly by Besikcioglu’s solid presence as the father while the gentle strength of the mother is well captured by Ozen, using small glances to great effect. Slow-paced and without music other than the calls and cries of the forest creatures, “Honey” suggests that while nature is not full of human kindness, humans may find salvation there. Venue: Berlin International Film Festival — In Competition; Opens: UK July 15 (Verve Pictures); Cast: Boras Altas, Erdal Besikcioglu, Tulin Ozen; Director, screenwriter, producer, editor: Semih Kaplanoglu; Screenwriter: Orcan Koksul; Director of photography: Baris Ozbicer; Production designer: Naz Erayda; Editors: Ayhan Ergursel, Suzan Hande Guneri; Production: Kaplan Film, Heimatfilm; Rated PG, 87 minutes. This entry was posted in Film, Reviews and tagged Bal (Honey), Berlin International Film Festival, Semih Kaplanoglu, Verve Pictures. Bookmark the permalink.